To describe Illusion of Gaia is an exercise in acrobatic decipherment. An amalgam of religious axioms, philosophical arguments, magical discord, fantastical influences, translation bafflement, and the overarching clash between light and dark with their cataclysmic ramifications, all while humanity is caught in between and subject to an unknown fate. Confused yet? 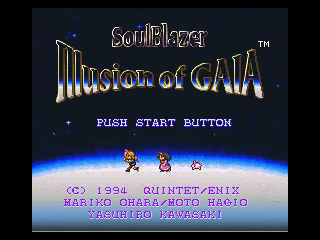 Illusion of Gaia is the second entry in the Soul Blazer trilogy/ Gaia series, yet this is the game that defines the series. The Quintet/ Enix team produced a game that not only surpasses its predecessor, but could easily be considered a standalone game. Even today, I am impressed with its superior gameplay and pleasing aesthetics. The depth of story the devs attempt should be commended. They took everything that made Soul Blazer great and improved it to exceptional levels. 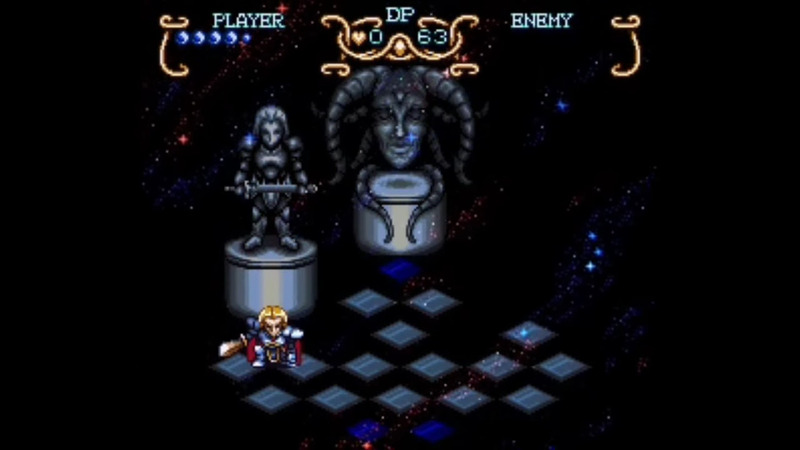 Illusion of Gaia continues the conflict between light versus dark and how their influences affect the world. 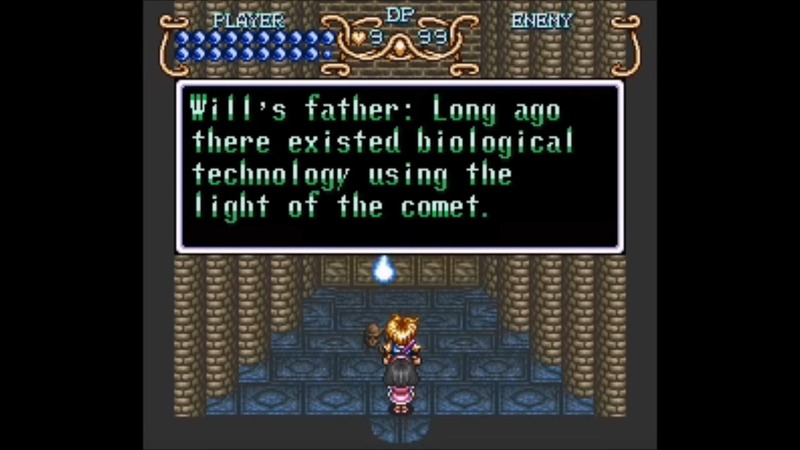 Through the use of an advancing comet (the Chaos Comet), Dark Gaia is unnaturally causing the living things of Earth to evolve and transform, warping life and throwing nature out of balance. As this comet approaches, the effects become more disastrous. Light Gaia calls upon the protagonist, Will, to fight off this threat by collecting relics across the world. Will, having the ability to use Dark Gaia’s powers to shapeshift, sets off on his worldwide quest. Along the way, he meets a colorful cast of characters, such as Kara the princess and Neil, Will’s cousin and a brilliant inventor. Will’s travels also reveal that other forces are at play, such as groups wanting to utilize Dark Gaia’s powers for themselves. Greed, murder, slavery, and kidnapping are some of the uglier faces humanity wears during the adventure. Will must ultimately reveal the mysteries behind these events, learn why he and Kara were brought together, and unravel secrets hidden within himself. In terms of the story, the Quintet/ Enix devs are once again determined in their use of religious and philosophical theories, as well as adopting a far darker tone than other RPGs of the time. Reincarnation, resurrection, and afterlife are all concepts revisited and explored in this game, as they are all present either as the results of, or as vehicles to, Dark Gaia’s manipulations. What is directly used to create depth of story is also implicitly applied to ask us more profound questions, such as the influences our beliefs have on our own existence. In game, Light Gaia shows Will a vision of his world without celestial interference. Would the game world be better off without the Gaias? Would our world be better off without faith, doctrine, or theology? It’s characteristic of Quintet/ Enix to get us thinking and ask ourselves these gripping questions. The game also broaches fate and whether people are destined to meet, regardless of the situation, and if certain actions or events are fated to occur unconditionally. The darker tones bring the story closer to reality, as our heroes observe hardships, such as starvation, death, and a fervid selfishness that incites the devaluation of human life. While there are moments of deep affection and genuine care for one another, the fear of losing loved ones and the loss of all hope is ever present. That overtone of fear with the desperation and anxiety it inflicts on the cast demonstrates the seriousness of their quest. Thought provoking storytelling and an emotionally driven cast come together to produce a narrative that becomes very endearing and immersive. Despite the story being a major improvement over its forerunner, it suffers from notable flaws that make the overarching narrative difficult to fully understand. Illusion of Gaia has one of the most complex plots in gaming, yet the writers did players zero favors in clarification when it was most needed. Personally, I could have used more detail surrounding the Dark Knight element. Initially, it is only implied that Will gained psychic powers from his first visit to the Tower of Babel a year ago. 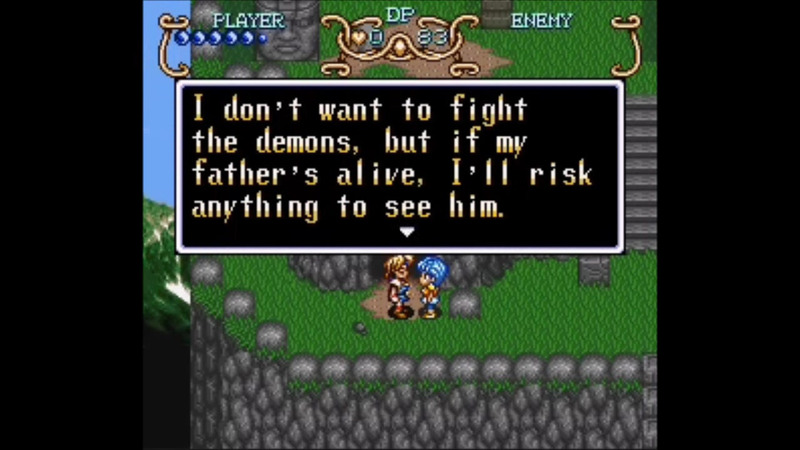 It’s more than that, as his first exposure serves as his awakening as the Dark Knight, but I feel that connection between comet, Dark Gaia and Dark Knight needed to be fleshed out. Will’s transformations and increasing Dark powers depend directly upon that fact. Light Gaia, meanwhile, only serves as Will’s guide within Dark Space and since Light Gaia only seems able to heal Will, this fits her limited Light abilities over the Dark Knight. However, I would have preferred much more detail to further distinguish Light Gaia and her limited role with Will from Dark Gaia and his indirect, increasing influence on Will’s abilities. I would also have liked more detail into Kara’s role as the White Knight. Again, at the tail end of the game, we get our first mention of a Light Knight. We also briefly learn that when the Dark and Light Knights come together, Shadow’s full power comes forth. Since Will was going to get powered up regardless as the comet approaches, he’s the hero until endgame. Kara only comes in at the end since I’m guessing Will’s Dark powers cannot defeat their source and needs Light to banish Dark. Hence the flimsy reason for both a Light and Dark Knight. However, it has been suggested and debated that Kara had a far deeper backstory regarding her Light Knight identity. This theory, resulting from losses in translation, I address further down. It’s also haphazardly dropped that the Knights are a product of bio-engineering……. Other major story failings are a product of a weak translation and censorship. Throughout the game, several lines that were supposed to be Will’s inner monologue are translated as dialogue and vice versa. There are other lines that, when translated, lack the emotional force needed for its scene. For example, the raft scene, in which Will is starting to develop feelings for Kara, the English translation fails to convey just how affectionate Will has become towards her. Failing to produce those emotional impacts is a constant in the translated version. Finally, too many lines are just mistranslated or missing, flat out confusing players as to what’s being said either due to misinterpretation or outright absent lines from the original Japanese text. It’s a tremendous detriment to the final product. Speaking of mistranslation and absent text, apparently Kara had a much greater backstory and significance to the plot. It has been speculated that Kara was kidnapped by her royal parents from Angel Village to gain them access into the tower for the comet’s power. There is dialogue in the pyramid after Jackal tells of the king’s scheme that suggests Kara knew she was adopted, as she states she was on this journey to find her father (unless that was intended to be Will’s dialogue and misplaced). Endgame, Kara is also mentioned to be thinking of her parents and it’s hard to believe she was thinking of the people she ran away from and that had sent an assassin to follow her. But, because of the atrocious translation efforts (and perhaps the stubborn censoring of religious content), none of this is ever made clear. The best anyone can do is theorize; the writers’ lack of thorough storytelling with an atrocious translation effort does such a tremendous disservice to the players. 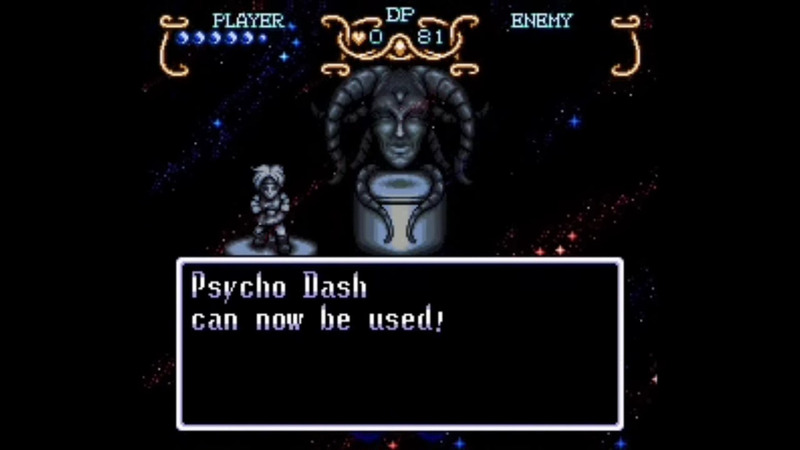 Fortunately, Illusion of Gaia features one of the most impressive gameplay and combat systems for an RPG and doesn’t require my bickering. 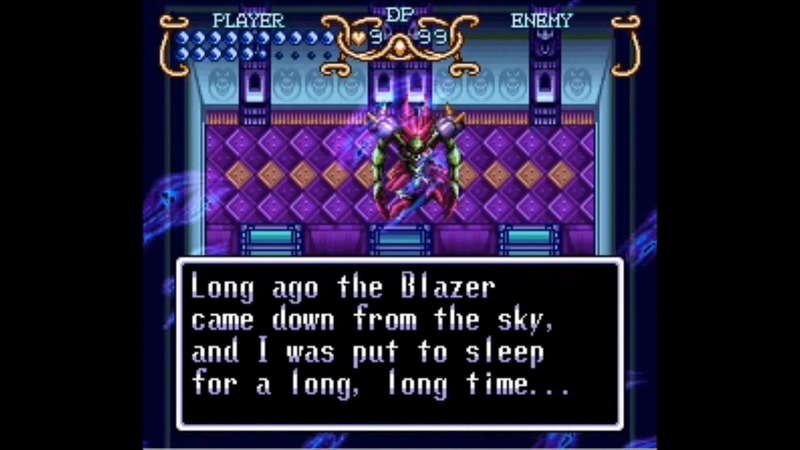 Combat is vastly improved upon over Soul Blazer with the transformation mechanic. Each form Will takes has its own set of powers and spells that provide an appreciated variance to combat. Normal slashing is nicely accompanied by slides, down-stabs, defensive spells, and ranged attacks. These powers are also utilized for the game’s puzzle solving elements. For example, Will may first need to transform into the Dark Friar to reach a distant switch, then transform back into his child form to slide through a small gap in the wall. As more powers are unlocked, the puzzles become more diverse. Gameplay is further distinguished by the unique leveling system. Will’s stats will only improve after collecting a single stat boosting item rewarded after defeating all the enemies in an area. It becomes imperative to defeat everything in order collect these items and improve Will’s stat. It keeps the game formidable and with the transformations and diversity in combat, it all comes together for an experience that stays favorably challenging and fun. 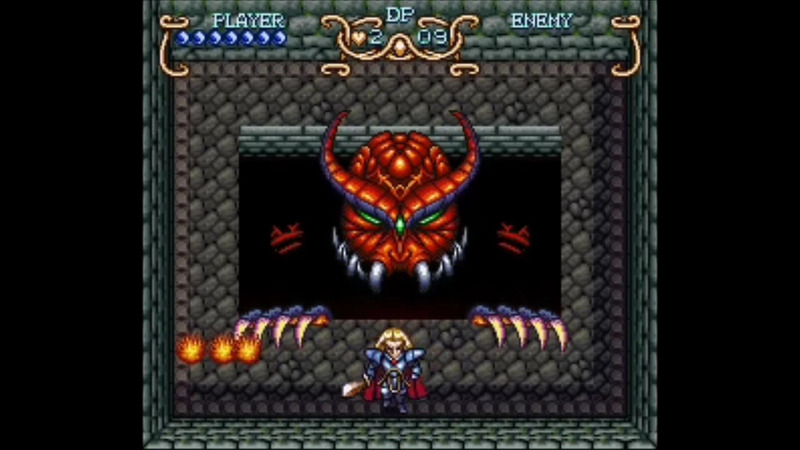 The aesthetics of Illusion of Gaia are also vastly improved. The visuals of the game are stunning and full of atmosphere. It’s obvious that the devs pushed graphics and color palette to their absolute limits and the result is a vivid world that is overwhelmingly captivating. There is plenty to see and the renditions of real-life locations, such as the Great Wall and the Nazca Lines, help bring this world to life. I especially appreciate the detail given to Will, Shadow and Dark Friar. From the wind blowing through Will’s hair to the glow and color changes of Shadow’s aura, the features and attention given to the main sprites truly make them come alive. The soundtrack is just as full of charm and purpose, as the dungeon tracks exude danger and fear while the town and village tracks provide a feel of tranquility and decompression during those breaks in action. There is also an appreciated amount of variety to each track, as they never become repetitive or dull to the point of unbearable. Far from it, this game’s soundtrack is easily one of my favorites. The Illusion of Gaia has so much to offer in terms of gameplay and story that there is always something new to discover. A strong combat mechanic and memorable aesthetics makes the game stand out amongst others in the genre. It is most definitely worth playing, as I myself have played it numerous times and continue to look forward to future playthoughs. I loved the story, but lament the potential it could have offered. 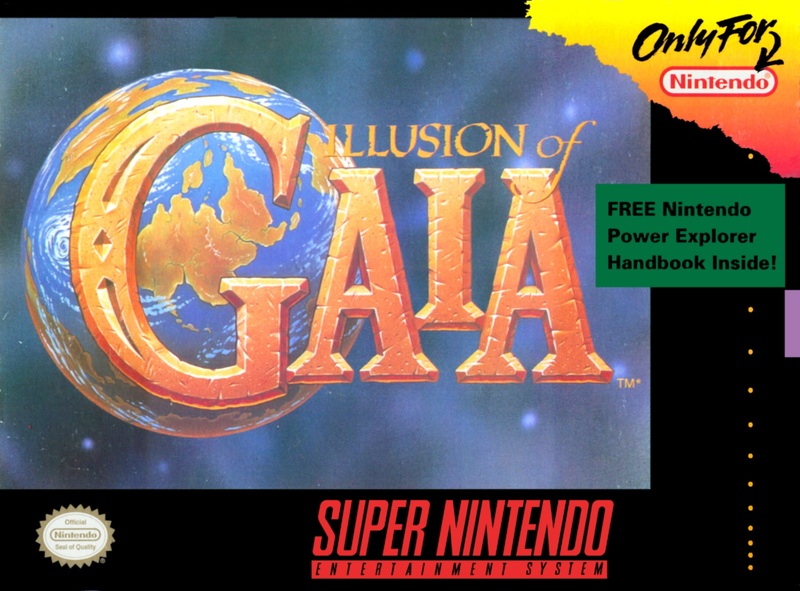 If only the censorship never occurred, the necessary detail was given, and an overall stronger translation was provided, Illusion of Gaia could have easily become one of the greatest of all time.